What Is Sports Vision Therapy? Did you know that almost 80% of perceptual input in sports is visual? An individual who plays sports, whether high school intramurals or a professional athlete, may have 20/20 sight. However, this merely means he or she can see an object clearly but does not guarantee that he can determine where the ball is in space, how fast it’s traveling, or whether it’s changing direction. Any serious athlete on almost any level of skill has invested time, sweat and energy in training his or her body to run faster, jump higher or throw harder, but how have you trained your eyes? In What Ways Can Sports Therapy Help You Perform Better? For optimal interplay between your trained body and your 20/20 vision, it is essential to begin a training program designed to optimize. Peripheral Vision - the ability to see people and objects 'out of the corner of your eye' while concentrating on a fixed point. What Are The Benefits Of Sports Vision EyeQ By RightEye? RightEye Sports Vision EyeQTM can improve athletic performance by identifying vision strengths and weaknesses. A series of tests quickly measures and analyzes eye movement, processing and motor skills that can affect how well you play your favorite sport. The RightEye EyeQ Report includes online video replay of pursuits, details of RightEye, left eye, and both eyes’ behavior versus the norms, and include recommendations to improve sports vision with vision training exercises that can be accessed by your school, coach or specialist. 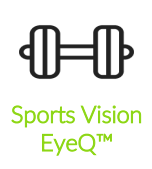 For more information on how RightEye Sports Vision EyeQ can help your patient call one of our vision therapists today for a consultation. In the same way that your trainer will spend time developing a basketball player's shooting stroke, EYEcenter Optometric will provide you with a personalized eye exercise program that will change and improve your eyes' ability to work together with each other, with your brain and your body. If you missed our sports screening event on October 6, 2018, call today to make an appointment today for a 10-minute sports vision screening.